JDC envoy sent desperate report on dire situation for German Jewry as Nazi government ascends to power. In 1933, Rabbi Irving Reichert, a prominent San Francisco rabbi, conducted a week-long study trip of the status of German Jewry at the behest of JDC’s German Relief Campaign, which was spearheading a campaign to raise $2 million to aid the beleaguered German Jews. His study surveyed conditions in Berlin, Frankfurt, and Baden-Baden, and included interviews with Jewish refugees in London, Paris, and Prague. Telegram from Rabbi Irving Reichert sent from Prague to Rabbi Jonah B. Wise in New York, June 1933. 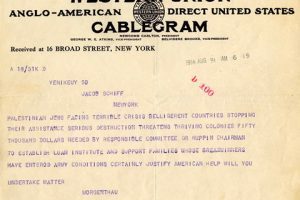 On June 27, Rabbi Reichert sent a cable to Rabbi Jonah B. Wise, rabbi of Manhattan’s Central Synagogue and a prominent leader of Reform Judaism, who served as national chairman of the German Relief Campaign. 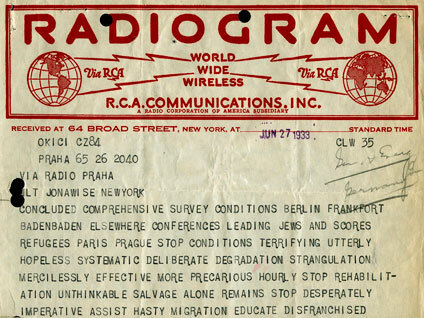 Reichert’s Radiogram drew attention to “terrifying[,] utterly hopeless conditions” and the “systematic…strangulation” to which German Jews were being subjected under the Nazi regime. This cable presaged a more extensive report which detailed the plight of German Jews who were now forced from schools and debarred from their professions under restrictive laws established by the Nazi regime, which had now come to prominence in the German government. 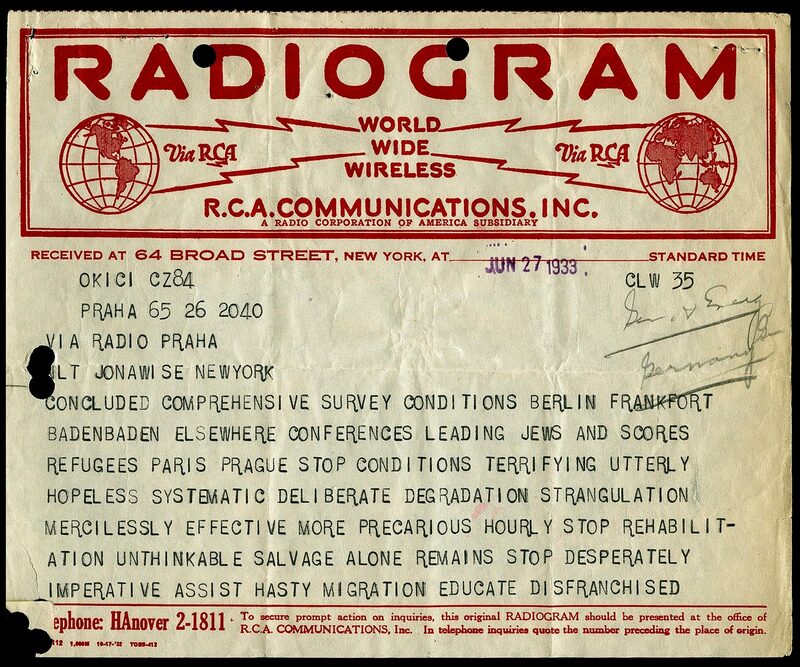 After the release of this report, the German Relief Campaign announced in July 1933 that campaigns were being held in over 300 Jewish communities, and that these campaigns had already raised a quarter of a million dollars to enable JDC to fund a variety of critical relief measures for the German Jewish community, including medical and child care, vocational and agricultural training, Jewish schools and educational activities, free loan cooperatives, and emigration aid. Between 1933 and 1942, JDC allocations to Germany totaled over $4.5 million. 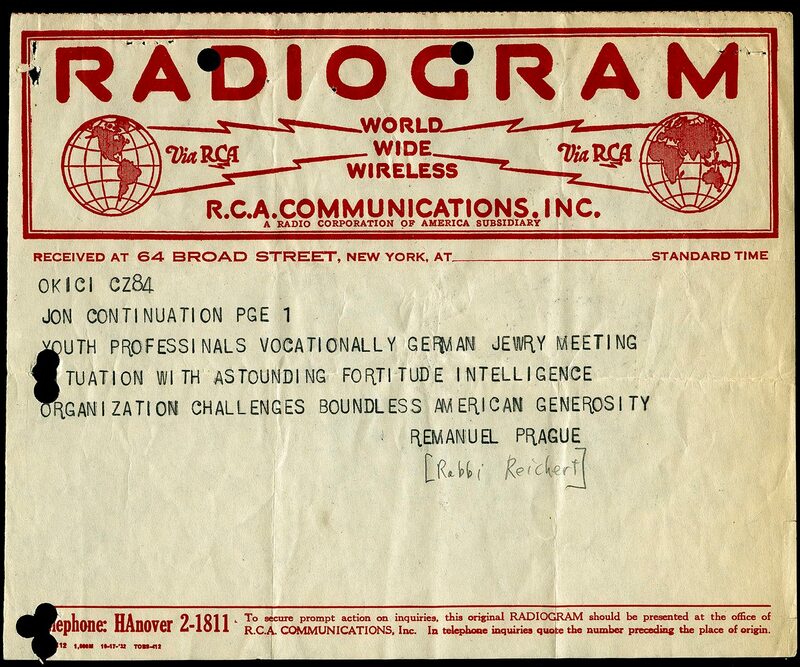 Learn more about JDC’s rescue and relief efforts for German Jewry at the onset of World War II in our 1933-1944 records.